On many locations, soils and waterways have been polluted with heavy metals. This type of pollution not only occurs at industrial sites, but also in rural areas, nature reserves, future residential areas and in depots of dredging sludge. Also rather often the groundwater contains an unacceptable level of heavy metals. Until recently the removal of pollution with heavy metals was a problematic one. In order to remove this type of pollution with chemical or thermal methods it was necessary to dig out the soil and transport it to a dedicated processing plant, often at a distance. This system results in considerable amounts of chemical waste and has as a side effect the production of trans­port related atmospheric pollution. Another practice digging out the polluted soil and dumping it in depots, only means transferring the problem and cannot be considered as a solution. Furthermore this often means devastation of useful areas elsewhere. It is clear that the above mentioned practices carry high costs, lead to a lot of transport activities and much chemical waste that has no potential for further use. Further­more, the transport of large quantities of soil by means of lorries means further harm to the environment. can assist you in cleaning up polluted soils in a better and cheaper way. By using our method, cleaning up soils using the metal uptake capacity of plants, scientifically known as Phytoremediative Extraction, it is possible to remove heavy metals from soils on site. As a consequence the excavation and transportion of polluted soils is no longer necessary. Our method can also be used to clean soils that already have been excavated and put into storage, such as dredging sludge. Parallel to the removal of heavy metals the decomposition of mineral oils and poly-aromatic hydrocarbons (PAH) can be stimulated by the enhanced activities of bacteria and fungi. Research has shown that the presence of plants and the intensive management of the vegetation cover results in an improved decomposing activity of both bacteria and fungi. After uptake through the roots the minerals are translocated through the vessel-system of the plant towards the leaves, where the chemical processes take place, that makes the plant grow. It has been shown that there are also plants capable of taking up heavy metals, if present in the soil. Because they are not necessary for the growth related chemical processes, the heavy metals are accumulated in the leaves. Depending of the plant species and the type and quantity of the heavy metal, the plant will store the total amount of heavy metals taken up till the end of the growing season, or till such a time that the leave or the entire plant dies due to poisoning. Not every vegetation type is suitable for Phyto-remediative Extraction; has the expertise to select the right type of vegetation cover, depending of the nature of the pollution, the soil type, etcetera. At the end of the growth season, the heavy metal content in the plant material is such that it can be considered as chemical waste and it has to be treated accordingly. takes care of the entire processing procedure of the waste at the end of each season. The various plant species have different properties, with regards to their capability to take up heavy metals from the soil. The type of heavy metal that will be taken up, as well as the quantity that will be taken up by a plant during a growth season is deter­mined by the plant species (See figure 1). Fig. 1. 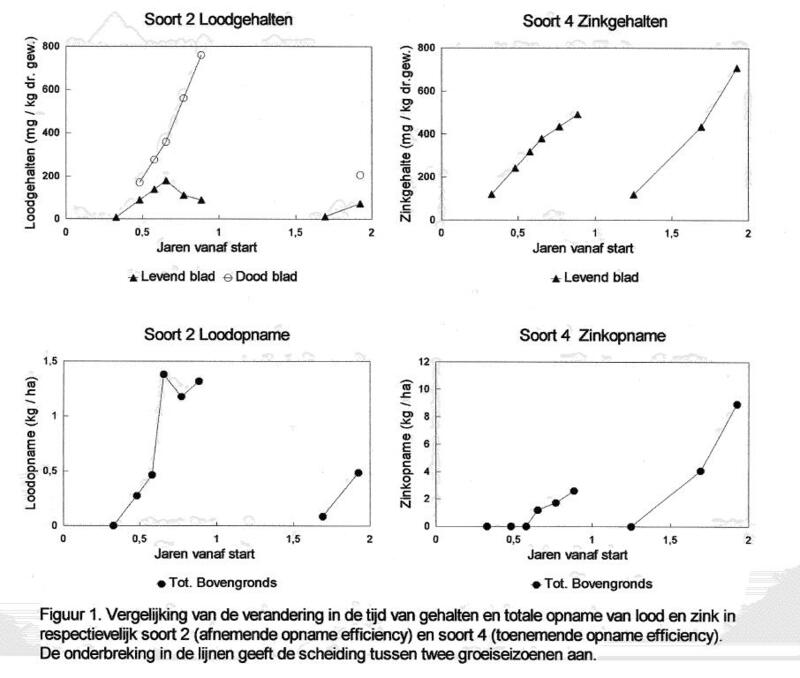 Comparison of the time dependent content of lead and zinc and their total quantity taken up by the plants (species 2 and 4, respectively). The interruption of the curves indicates a separation between two growing seasons. To ensure efficient progress of the phytorem- ediative extraction process an extensive knowl- edge of the various suitable plant species is necessary, particularly as regards the response of a plant to its local environment. Also know-how in fields of waste removal and processing and logistics is of utmost importance. Environmental Options has this specific knowledge and expertise. Presently, as a front­runner, puts phytoremediative extraction into the market in The Netherlands and elsewhere. In the analyses and test phase will design a draft treatment plan, based on the results of soil analyses and the desired final result of the phytoremediative extraction process. The plan is tested at a small scale and adjusted where and when necessary. In the implementation phase the final treatment plan is decided upon in mutual discussions with the customer is put into operation at its full scale. closely monitors the progress of the phytoremediative extraction process and makes adjustments where and when necessary. During the execution and monitoring phase the phytoremediative extraction process operates according to the updated plan of operation. The processing of the annually harvested waste will continuously be adjusted according to the latest views and developments in waste processing. A biologically based cleaning method, like the one introduced here is never an instant product. To arrive at the desired result usually requires a time span of a couple of years. Of course, the time needed also depends of the nature and size of the pollution and of the desired final level of cleanliness. Also it is possible that, due to innovative develop­ments, the treatment time can be reduced; in such case will always adjust ongoing projects according to the latest developments in phytoremediation technology. In a pilot project, at the site of a metal recycling firm in The Netherlands (see photograph on the front cover), it has been shown that already after two growing seasons a clear diminution of the heavy metal contents in the soil was achieved. 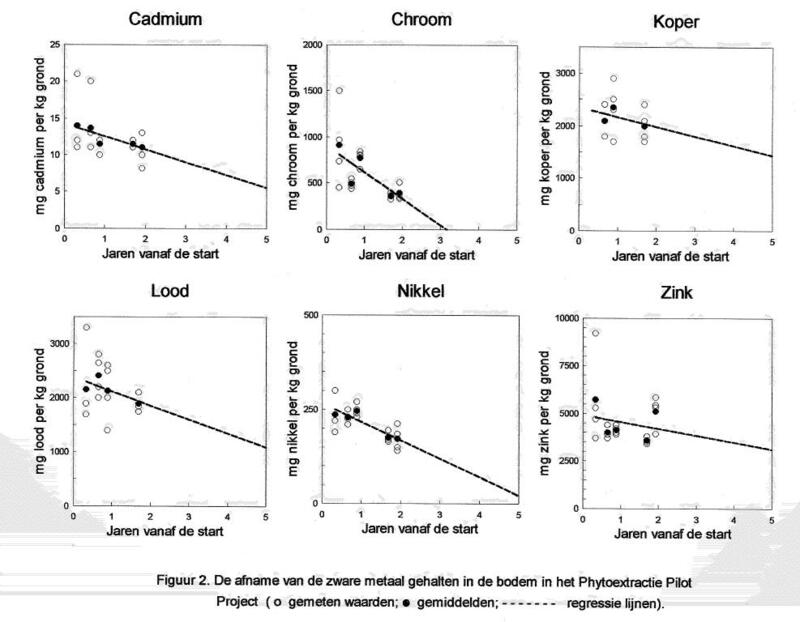 Figure 2 highlights this for the various heavy metals. Research outside The Netherlands resulted in comparable results. Fig. 2. The decrease of heavy metals in the soil due to phytoextraction (open circles represent measured values, filled circles represent averaged values, and the dashed line is the regression line). Fig. 3. Zinc contents in the supply and the tanks of the groundwater remediation system of photo 1 . Environmental Options is a venture of Environmental Options B.V., De Meern (The Netherlands). Environmental Options B.V., has extensive knowledge and experience in environmental research and monitoring, as well as on the biological / ecophysiological aspects of the phytoremediation process. No transportation of soil is needed; principally soil treatment is done on site. The biological structure and functioning of the soil usually remains intact. An area under treatment has an attractive appearance, through the use of vegetation with naturally occurring, "wild" plant species. Along with a phytoextraction treatment other methods of biological soil cleaning can be applied simultaneously. The total cost of phytoextraction remain well below the price level of soil cleaning methods currently in use. The scientific process and monitoring, the overall management, as well as the administrative monitoring and control remain in one hand: being .